I am testing various technical trading rules (TTR) on the cryptocurrency market. I have already setup some significance tests, to compare the returns and volatilities. I would now like to test it from a different angle using the ROC model, often applied when backtesting PD [Probability of Default] models. I am just not sure if this is actually feasible in the environment I am trying to apply it. The logic I have applied until now is that if the output of my TTR is a "BUY" and the underlyings returns that day is bigger than zero, it is a TRUE BUY on the other hand if the return of the underlying is smaller than zero that day I get a FALSE BUY. Having this information I think I should be able to set-up a ROC model. My question here would be, is this approach actually feasible? Has someone already taken this approach? So ROC performance metrics are common place in machine learning applications, particularly for classification tasks. Looking at the way you have setup the question here you wont be able to plot a ROC curve as it relies on a continues output (not discrete). 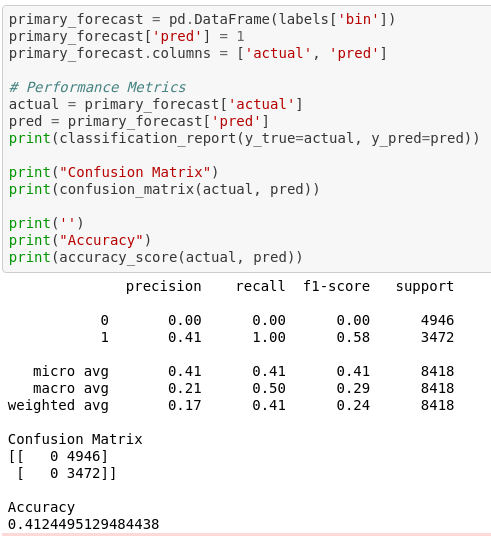 You would however be able to plot a confusion matrix and look at performance metrics such as precision, recall, and F1-score. All you would need is the actual forecast vs your predicted forecasts. Note: This strategy I built here uses a secondary model to determine when to place a trade based on the primary technical model and that is why all of predictions are labeled as 1. It does however still illustrate the point. Not the answer you're looking for? Browse other questions tagged quant-trading-strategies backtesting statistical-finance technical-analysis statistical-significance or ask your own question.